Take a walk in the countryside this autumn: there’s lots of free food for the taking! From chestnuts to apples, blackberries and rosehips, the countryside’s harvest can be made into delicious autumn fare to enjoy at home. Here’s our beginner’s guide to foraging. It’s important to follow the countryside code when you’re on public land. This means shutting gates behind you, leaving trees and hedgerows intact, and keeping dogs under control when you’re near cattle. If you’re foraging then you should be careful not to strip a hedge or tree of crops: you must leave enough for wildlife, whose survival may depend on finding enough winter leftovers. Take care not to damage trees or shrubs. It’s a good idea to look on the ground first – fruits and nuts that have fallen from the tree are ripe. Don’t shake or beat trees or hedges to collect free food. Finally, don’t turn up with a truck – take a reasonable amount home with you, leaving some for other foragers! In early October, chestnut trees are laden with spiky green orbs. They will fall and open when they’re ripe (so don’t beat the tree to get them down). Inside each green case are two or three sweet chestnuts; when ripe they’re a rich, shiny brown all over. You can distinguish between chestnuts and horse chestnuts (conkers) by looking for a little tuft on the top of each chestnut. 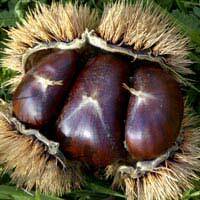 Conkers are smooth at both ends, but edible chestnuts have a spiky tuft at one end. From early autumn, you’ll find rosehips, sloes and blackberries springing up in hedgerows all over the place. A good reference book (such as ‘Edible Wild Plants and Herbs’ by Pamela Michael) will help you to identify the berries, if you’re a beginner. Don’t forget that these berries provide winter food for birds, so leave plenty on each shrub. Find a good spot and you’ll have no shortage of berries to put into tubs and take home. Blackberries freeze very well, and sloes and rosehips can be preserved – try making cordial or sloe gin! To prepare chestnuts, slit the skin of each one and drop into a large pan of boiling water. Simmer until the chestnuts feel tender, then drain over the sink and let them cool a bit. When they’re not too hot to handle, use a sharp knife to peel away the brown skins and the paler brown under-skins. You can freeze the prepared chestnuts, whole or pureed, or you can use them straight away – they won’t need any further cooking. Roast them with salt or add them to a rich stew for a winter warmer. Prepare your fruit as soon as possible after picking, to benefit from the freshness. Wash and freeze your blackberries on a tray, arranged so they aren’t touching. When they’ve frozen, put them into freezer bags and seal – this prevents the berries from thawing to a pile of mush. Blackberries can be used to make lovely sorbet, or thrown directly into banana smoothies or apple pies or crumbles. Rosehips are more complicated to preserve. They have tiny hair-covered seeds inside, which should be removed for eating. This means you can either open and de-seed the hips, or simmer them with sugar and water before straining through a fine muslin. Rosehips make a nice addition to jam, or a cordial that’s very rich in Vitamin C. If you have a good crop of sloes, try making sloe gin by pricking and marinating the berries in gin with sugar.